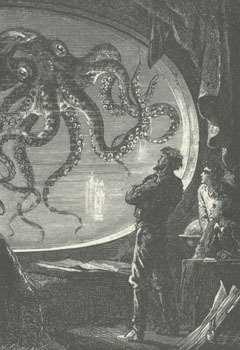 As the Nautilus slipped out of its dock with Captain Nemo at its helm, its dark, stealthy shape began to disappear beneath the waves... the sea would never be the same again. During my study on the Nautilus, I have written various pages and articles regarding this domain. Here you will find all the pages realated to this famous ship. Enjoy!!! Different Designs: This is where you will find some designs of the Nautilus that I have conceived. Of course, everybody has their own visions of the Nautilus after reading the novel, this is mine! My Nautilus' Interior: What did the Nautilus look on the inside? Well, click and find out!! This is just one of the my interpretations of the N's guts! Movie and Story Comparisons: When a movie is made based on a certain book or story, the producers always tend to alter the actual events of the original work. During the many adaptations of Verne's 20000 Leagues, there have been various Nautilus concepts made as well. Here are just some comparisons that I have made. How to simulate the Nautilus in your own house! This is a fun article that I've written based on a similar page that I saw on the net. Ever wonder how it would be like to live inside the Nautilus while remaining in the comfort of your own home? Well, click and find out!! Jules Verne Exhibition!!! (New!!) This is an entire album dedicated to pictures that I took at an exhibition about the famous author. This exhibit featured many of his first-edition books, and I was really amazed by seeing some of the original manuscripts of his works. Unfortunately, I couldn't take pictures of every inch of the exhibition... but I did take pics of the Nautilus-related goodies!!! Click the picture to find out more, over 30 images!!! My 1/100th scale RC Nautilus: This is an entire section dedicated to my very first RC-submarine that I built. The model is based on one of the designs that I did a while ago.